My life taught me one thing: catch the moments! I was never a spontaneous person BUT I am able to learn. If I can spontaneously say YES so I better stop searching for excuses for myself to find reasons for drawbacks. BUT it does not mean I have to be 100% spontaneously. Those one percent Mr. Planing-Man was the reason for planing the tomorrow dinner. I made a zucchini salad because it needs one day for a better taste. For the zucchini salad you need some zucchinis, garlic (but ask before if someone likes garlic), basil, vinegar, olive oil, salt, pepper and - that's my secret: some light white wine like Riesling or Morio Muskat. 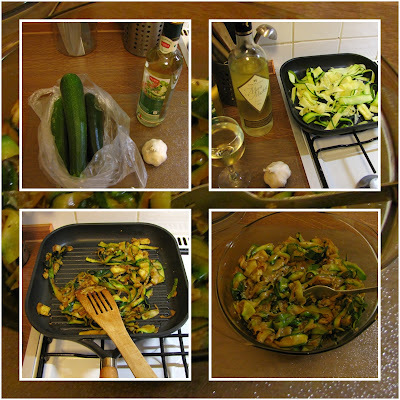 First slice the zucchinis and grill them on a pan in a little bit of oil (one teaspoon per portion). When you're done, put all the ingredients to a bowl and mix it well. Put it over night to the refrigerator and enjoy.